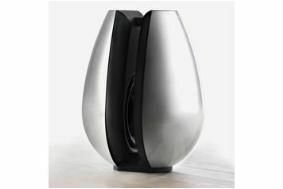 Bang & Olufsen launches tulip-shaped BeoLab 11 subwoofer | What Hi-Fi? The BeoLab 11 sub stands just under 31cms tall and weighs just over 7kgs, and claims to be super-versatile when it comes to placement. The unit can be rotated in to any direction when sat on the floor but can also be mounted on a wall, an unsurprisingly rare feature amongst subs, and is supplied with a wall bracket. Composed of two identical loudspeaker cabinets, with baffles facing each other, the BeoLab 11 has outer shells made of aluminium and available in silver or white. The sub uses two 6.5in drivers and is fully active with integrated 200w power and electronics, and is the first of B&O's subwoofer to use the company's acoustic balance principle for reducing extenral vibration. The Bang & Olufsen BeoLab 11 will set you back around £1550 and should be in stores over the next couple of weeks.